Looking for an exercise program that targets your specific goals? 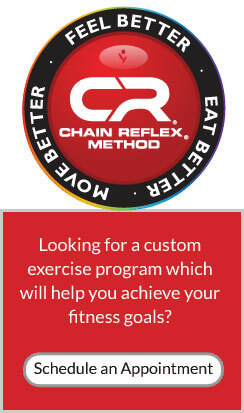 Our Chain Reflex® method is a unique functional training technique where the exercise is completely customized to YOU. Each session is conducted one-on-one with Dr. Daryl in a safe environment and will provide an appropriate level of intensity for your age and fitness level. We offer all of the training tools available at any health club, the oversight of a doctor for every session, and the fundamental understanding of the body’s ability to strengthen and heal itself. It’s not just personal training or physical therapy. It’s not just nutrition or naprapathy. Dr. Daryl is more than a fitness coach—he is a doctor whose mission is to inspire personal change through health and fitness. It really is all about YOU and you can find it all in one place. Whether you are dealing with an acute injury or chronic pain, Dr. Daryl’s expertise can help get at the root of your problem to help with long-term pain management. It is common for mobility issues in one part of the body to manifest as pain in another part of the body. Treating the symptoms will not always fix the origins of the pain. Rehabilitation involves the restoration of proper joint function and the strengthening of supporting muscle and soft tissue. Dr. Daryl’s naprapathic training will help alleviate any acute pain and he will develop a strategy for you that combines hands-on manipulation with a program of stretching, resistance training, and exercises to improve muscle tone. This program translates to accelerated recovery from your injury or improved chronic pain management.